Ricardo Morales-Hernández, studio view, June 2017. Chicago Manual Style is pleased to announce its inaugural exhibition, Forced Autumn, bringing together works by Allora & Calzadilla, CARNE Gallery—Adriana Martínez, and Mariana Murcia—and Ricardo Morales-Hernández. In a letter to the curators, Morales-Hernández (b. 1980) described the natural effects of Hurricanes Irma and Maria on the island of Puerto Rico, its inhabitants, and its infrastructure as a “forced autumn,” equating the devastation wrought by the storms with the ongoing colonialist agenda perpetrated by the United States’ Federal government. Following this conflation of natural occurrences and geopolitical power structures, Forced Autumn brings together three artists and collectives whose works are staked on the upending of phantasmagoric images of the island through consideration of material processes, site, and image distribution. The selected artists utilize methods of appropriation and subversion to contend with the ‘exotic’ image of the island propagated within the colonial frame. The work is exhibited alongside a selection of recent acquisitions by CARNE Gallery—an artist collective founded in 2014 and based in Bogotá, Colombia. Featured in Forced Autumn are works by Mariana Murcia, and Adriana Martínez, from the curators’ personal collection, originally installed as part of the collective’s exhibit FAMA (2017) in San Juan at the artist-run gallery km 0.2. In a series of vinyl cut outs on postcards of Columbia by Martínez, each covered with the word “FIN,” (which translates to ‘END’) similar to the format one would find at the end credits of French Cinema, the letters partially reveal the image, though the black field largely obscures the landscape of the touristic images. 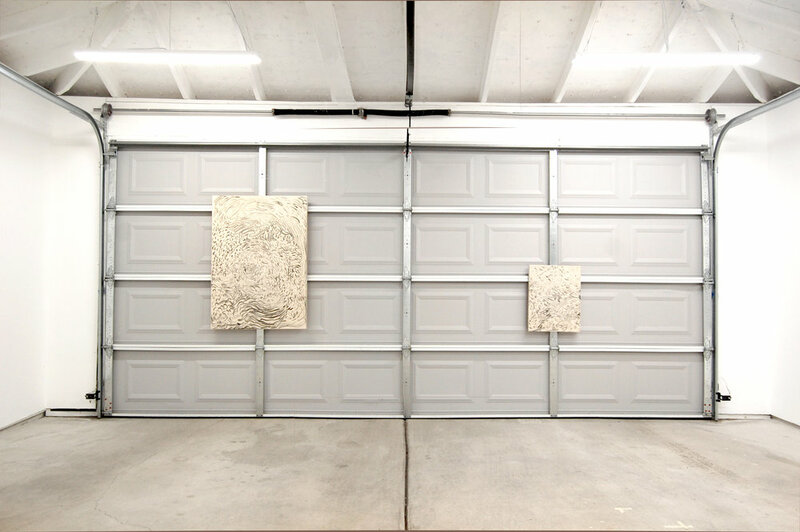 The series is a continuation of her works, which were first exhibited as larger scale paintings on world maps at the Museum of Contemporary Art Detroit (MOCAD) in her solo exhibition Detroit Affinities, curated by Jens Hoffmann earlier this year. Presented alongside these pieces are two works by Mariana Murcia; digital prints on seed packets. The seed packets, in dialogue with her ongoing sculptural series Gerberas, depict close-up images of the works, which are comprised of flowers whose petals have been cut into squares. At once a mirror of the process, and an imaginative departure of the origin of sculptures, Murcia’s flower forms are transformed into an image of itself, as though a bouquet made of out of pixels. At the core of the exhibition are a series of paintings by Morales-Hernández—based between San Juan and Aguas Buenas, Puerto Rico, whose studio is sited in a mountainous bamboo forest within the center of the island. Surrounded by fauna and large boulders, and containing a single white wall, the majority of his works are produced in nature—a type of “Green Cube” space, a term coined by Stefan Benchoam and Pablo Léon de la Barra, two of the curators of La Gran Bienial Tropical. 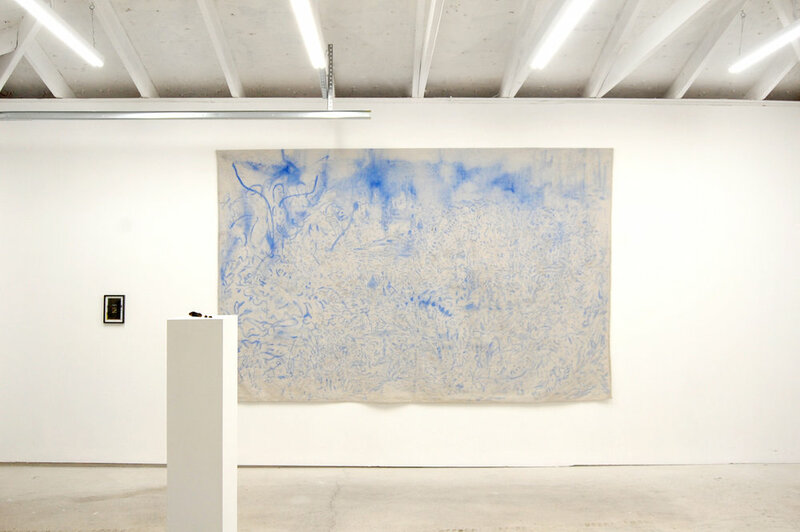 In these works, a series of drawings on canvas executed in both charcoal, manufactured by the artist from the organic residue surrounding his outdoor studio space, and blue construction chalk, Morales-Hernández’s imagery oscillates between the abstract and the figurative, depicting tropical, or paradisiacal, landscapes against the backdrop of geopolitical struggle on the island.